Moog Industrial Group delivered to race car manufacturer Dallara a high performance driving simulator for race car test and simulation. Dallara had been looking for a way to effectively shorten product development time and reduce the cost of testing and driver training compared to track testing. Dallara asked Moog, the market leader in electric 6 DOF (six degrees of freedom) motion bases, to provide the motion system and software for the driving simulator. 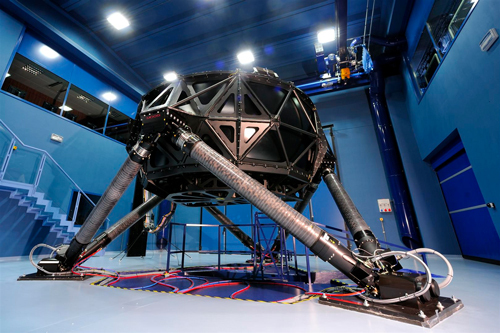 The solution is based on high-fidelity motion simulation technology that has been successfully used in innovative systems for testing and training for the aerospace, defense and automotive industries for decades. Dallara Automobili based in Varano Melegari, Italy provides design, engineering and support for some of the world’s most competitive car racing teams. Since the driving simulator was delivered in 2010, Dallara has experienced a range of benefits from using the Moog Test System including saving training time and costs, eliminating potential problems and safety concerns with using a racetrack, enabling better evaluation of design choices and providing early feedback in the development process. The high performance driving simulator was specially developed for test and simulation in motorsport. For this application, very low latency and high acceleration and velocity are required in order for race car drivers to experience the most accurate feel of the car’s behavior. For the 6 DOF motion system, Moog designed new actuators that feature higher stiffness at lower weight in order to meet stringent frequency response specifications. The integration of a Moog control loading system to simulate the force feedback during steering, the special shape and construction of the dome, and the high quality visual system also helped improve the fidelity of the system. The advantages of preparing drivers for races in a simulator are numerous. Dallara saves considerable time and money without compromising training quality. Drivers can even feel the little bumps in the race track that are so characteristic of certain circuits as a laser scans the race track and the results are loaded into the circuit software model. When combined with the highly responsive Moog actuators and sophisticated algorithms in the motion cueing software, this creates a highly realistic driving experience. Training in the simulator also helps Dallara to optimize the car settings prior to the race. As a result, fewer training laps are needed to reach the optimal settings. Even race tactics can be discussed, prepared and trained while using the simulator. Another advantage is that a simulator is available every day, all day, whereas training on the race track is bound by time limitations. Other important benefits are that the simulator eliminates many problems associated with a racetrack and improves safety. When training is done on the test track, there is a chance that the car might suffer electrical or mechanical problems that can negatively impact the training process and even influence the turnout of a race. Even though racing on circuits has become safer, it cannot compete with the absolute level of safety that a professional simulator provides. In addition to the advantages of driver training, Dallara has reduced its design and development times for car parts, bodies and complete models. The simulator makes it possible to accurately measure the effect of certain design choices. The new car model is loaded into the simulator and the driver can then test it. The procedure can be used for assessing new aerodynamic parts, springs and shock absorbers, and testing how tire behavior and degradation changes with the level of fuel. A simulator verifies driving aspects of a car design just as a wind tunnel does this for aerodynamics. There are numerous advantages to using a driving simulator to obtain driver feedback early in the development process including identifying improvements in the vehicle model and reducing the need for design alternatives. A simulator environment also offers the possibility of including feedback from less experienced drivers. It provides a safe environment under all kinds of driving conditions, including more dangerous maneuvers. Moog has provided motion systems for driving simulators used by a variety of automotive OEMs and component manufacturers. Driving simulators with various setups can also be used for other applications, such as evaluating the ride and comfort of a car, investigating the behavior of drivers, and evaluating active driver assistance systems. In applications like these, a high performance driving simulator also represents an extremely useful tool for developing designs of road cars and optimizing their prototypes. The required level of fidelity for the application plays a crucial role in selecting the type of simulator and motion system and Moog works with customers to evaluate requirements and ensure the right technology is used. Fill out the form to download the document. You only need to complete the form once to access Moog documents. An error has occured, please try again later. You must agree to allow Moog to contact you by email. You must agree to allow Moog to contact you by phone. Ⓒ 2019 MOOG INC. ALL RIGHTS RESERVED.